Does Iran hold key to Dutch murder mystery? 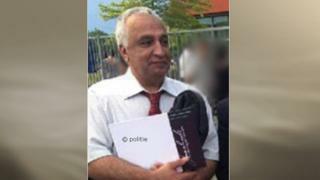 The Iranian ambassador to the Netherlands has refused to comment on allegations Iran was behind an assassination that has baffled Dutch police for more than two years. It follows reports that the victim, named by police as Ali Motamed, had been living near Amsterdam under an assumed identity and was actually one of Iran's most wanted fugitives. The 56-year-old is suspected of being Mohammad Reza Kolahi Samadi, who was accused of planting a bomb that resulted in the deadliest attack in modern Iranian history. Two assailants shot him dead at point blank range in December 2015. In March two men were detained in connection with the killing. Mr Motamed lived in a neat terraced house with his wife and teenage son in the town of Almere. He worked long hours as an electrician. Neighbours say he was a pleasant, quiet family man. Police say he had no criminal connections. Yet his murder bears all the hallmarks of a contract killing. The question is, who would want him dead? The killing took place in a peaceful neighbourhood. Here, bees flit between clumps of lavender and the screams of children waft across from a school playground. "It's just sleepy suburbia," says Paul Vugts, a local crime reporter. "For me it's a huge story. If it's true, we have world politics in our backyard." There is a theory that it could be a case of mistaken identity, but evidence suggest otherwise. CCTV footage shows a dark blue BMW making three trips to this address. On the first occasion, Mr Motamed left home later than usual. The second time, police say the attackers did not go through with the killing because a neighbour came out at the same time as Mr Motamed. It was on their third visit that the men, dressed head-to-toe in black, opened fire and left. The getaway car was later found burnt out nearby. Phone records show that on each occasion the attackers made the journey from Amsterdam to lie in wait, suggesting that they were sure of their target. It was Ali Motamed's widow who told police that her husband was concealing a secret past, according to Paul Vugts. In 1981, a bomb killed 73 people at the Islamic Republic Party headquarters in Tehran. Among the dead was second-in-command to Iran's then-Supreme Leader Ayatollah Ruhollah Khomeini. Chants for revenge went up as the bodies were recovered from the debris. A young man, Mohammad Reza Kolahi Samadi, was accused of the attack and disappeared. He was sentenced to death in absentia. Ali Motamed's widow, Mr Vugts says, told police that her husband was in fact Mohammad Reza Kolahi. He had told her so in 2000, when Iranian media circulated old pictures of him, confirming that authorities were still actively looking for him. "He always told his son he would tell him the whole story once the son became 18, but that never happened," Mr Vugts says. "The most logical [explanation] is that the secret service of Iran caught up with him," says Mr Vugts. The reporter used his underworld contacts to try to join up the dots. "The weird thing is, the ones accused of shooting [Ali Motamed] are just regular Amsterdam guys from the streets." In the past, Mr Vugts says, Iran has used the militant group Hezbollah to assassinate people. Mr Vugts' sources think Hezbollah recruited criminals from Dutch drug scene to carry out this killing. "Iran doesn't want to put the fingerprint on this assassination," he posits. The chairman of the local conservative liberal party (VVD), Ulysse Ellian, has asked the Dutch government to investigate reports that Ali Motamed was actually Mohammad Reza Kolahi Samadi and the victim of an Iranian state-sponsored assassination. Mr Ellian is of Iranian descent. His father opposed the regime and fled Iran when Mr Elian was 15 years old. He speaks slowly, conscious his words will quickly spread back to Tehran. "This is not something that happens every day. Only the mere fact of the suspicion of state involvement... gives reason for concern. "I fear it will be difficult to prove who he was but what I want to know is what are we going to tell all the people who witnessed this assassination in their neighbourhood and we have no answer. Neither the Netherlands nor Iran are confirming his identity. Maybe we will never know," he says. Approaching the iron gates of the Iranian embassy in The Hague, I was greeted by a glare from a police officer in his security cabin. A public information officer who came outside to meet me says he recognises the name Reza Kolahi but explains he is not authorised to speak on behalf of the Iranian government in this case. He later responds by email - no-one at the embassy is able to talk about it. A spokesman for the Dutch prosecution service told the BBC: "We have two men in custody who are suspected of being involved in the death. The investigation has not led to any signs of involvement of Iranian authorities." In the meantime police have offered a 10,000-euro reward (£8,800; $11,600) to anyone who can "complete the puzzle" - a sign that this murder mystery is far from solved.